Not so long ago I realized that there are quite a few occasions when friends asked for my help in finding them a watch to wear and enjoy. It is not an easy task at all because a watch, as we all WIS know, is not just a time telling device. A watch creates a special bond with its owner, and tells more than just the exact time. It can say a lot about the man/woman wearing it, about the relationship that the owner has with Time itself. It should match the lifestyle, the goals, the dreams and the way of thinking of the one that has it strapped on the wrist. So, it is not an easy task at all. In order to find the ideal match, when suggestion one, we should know a thing or two about the one buying it. And knowing someone is hard, really hard because a lot of times we don’t know ourself that much. Today I will talk about a Citizen Alarm Date and how I chose this one. 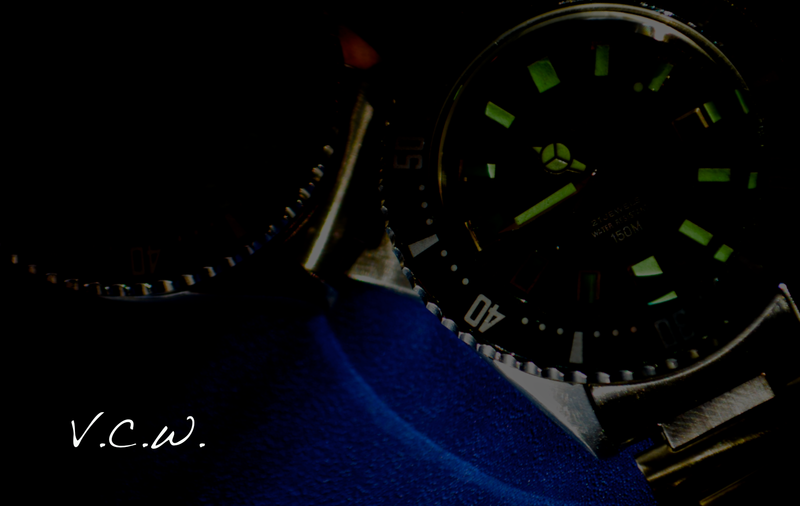 You can read about it’s technical features HERE, now we will talk about the process of suggesting and choosing a watch. Are you a “vintage” guy or a “modern” one? When and on what occasions do you plan on wearing it? Do you plan on swimming with it? Date or no-date? Is this feature important to you? White dial, black dial or colored one? Out of this questions others will emerge and we can narrow the possibilities down to just a few and most of the time we will feel what the right piece is. I chose this Vintage Citizen Alarm date 4H for my friend and I will show him the watch today. I am still unsure if he will like it or not and I am taking a chance here writing and posting this article before he will actually see the watch later today. He will not read the article prior to having the watch in his hands and he is not yet a member on Vintage Citizen Watches group on Facebook. He is a dentist and a bloody good one in fact. A young dental surgeon and he is just starting his watch journey. Little does he know that this “disease” has no cure and once you start it is going to grow into a lifetime addiction. In fact this is how I will know I made the right decision if in a few years he will be the one showing me watches. Time will tell. So… back to my friend and (probably) his watch. 🙂 He is more of a vintage guy and I guess a manual wind with alarm will make him interact with the watch more. This way he will connect more and see how it feels. The size is suitable (36mm) for a variety of activities and outfits and he can wear it on bracelet or on Tropic in the dental clinic, on leather with a suit or even on a Nato with summer beach attire. Just don’t swim with it. Washing your hands and getting caught in the rain will be no problem because the watch is in fact Parawater. (how many times did I tell you how I love this term?) The bracelet is the original one the watch was made with in January 73. The curved end original Tropic, a brown leather strap and a colored Nato will provide just enough diversity to play whenever he desires a change of look and feel. The crystal is acrylic so I will tell him, in half a year or so, about Polywatch and later on about polishing the stainless steel case if he asks. Of course I will tell him what scratches mean on a watch and how they build character but we will see what the future has planed for him and his WIS adventure. So, bottom line, the watch is ready for him, not fully winded because I have to show him how to do that, on the original bracelet, ready to be adjusted and strapped on. I hope you will like it and will serve you well my friend, wake you up in the morning and give you a lot of pleasure wearing it, hearing it, interacting and looking at it. If anybody else has a cool story about how someone chose a watch for him / her, or vice-versa, I would love to hear it as a comment on this article. At least once a week I get a mail, a comment or a message about sourcing a part for someones loved vintage Citizen watch. It may be a missing bezel insert or an original crystal. Someone is looking for a movement part for a Jet calibre or for Chrono Master hands. Maybe you are searching the original Citizen diver strap or a bracelet link to buy in order to restore your watch. 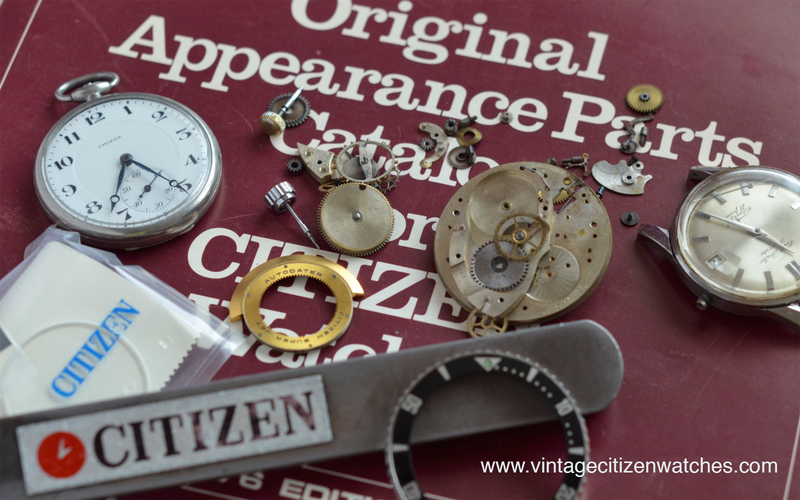 We are all looking for something… So: where can we find original parts for our vintage Citizen watches? Is there a special secret place for them? How to do it then? Your best bet would be to find a “donor” watch. That means finding a junk watch that has the part you are looking for, buying that watch and get the part. Of course, keep looking online for your original NOS part, you might get lucky in a month or maybe a few years… or probably never. Conclusion? Keep looking (day and night)… you can never know when you will find the needle in the haystack. Good luck! I wrote a few articles about Citizen alarms powered by this movement so the data is the same: a hand wound movement, calibre 3102 (date), 21 Jewels, 18,000 bph. The twin crowns are for time setting and winding the main spring and the other one for setting and winding the alarm. The crown at 2 o’clock in first position is winding the alarm while the alarm is deactivated. If you pull it in the second position you can set the alarm (counterclockwise) and the alarm is activated. Pressing it while the alarm is ringing will stop it. The crown at 4 will wind the watch and pulling it out will set the time. The alarm will ring for about 13-16 seconds. The case is black coated and so is the bracelet. Read about another beautiful blackie V2 HERE. The three crowns, the bezel and the case back are made of stainless steel and are polished. The dial is gorgeous, black, with applied luminous hour markers that are still glowing today. The date is located at 3 o clock, in a white frame, and is printed in white on a black date wheel. The second hand is orange and we have one more color, yellow, used for the inner bi directional rotating bezel. 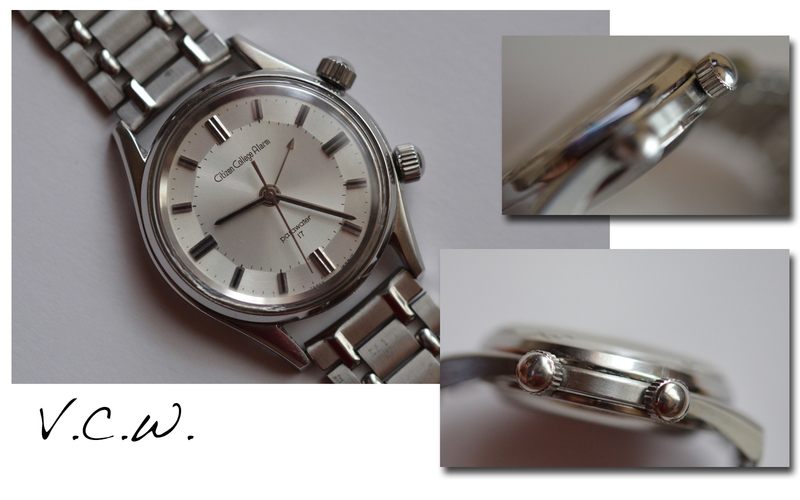 This bezel is operated by the third crown, the one located at 10 o’clock. You can use this feature for easily reading the elapsed time, up to 60 minutes, just as you do with your usual diver. Read more about other alarms on the dedicated page HERE. Citizen had three calibers for their alarm watches. The first one, and probably one of the most beautiful timepieces, is this little part of history. Watches powered by this movement were made around 1960. The first one seems to have come out in 1958? making it the first one of a long successful series of alarm watches. The case is gold filled and has an elegant look, with beautifully shaped lugs and well chosen crowns. Speaking of the crowns, the lower one sets the time and winds the movement. The upper one is for setting the alarm and winds it as well. This is the same for all Citizen alarms. The entire case is polished except for the snap on stainless steel case back that has a central circular brushed surface. The case back can be placed only in a certain position so that the hammer of the movement could strike the pin attached on it. In fact this is how the alarm works. (To hear a Citizen alarm, click this LINK) I like the way the inside of the case back is finished and engraved. The strap is black, original too, and the buckle is, as expected, gold plated (filled?). The dial is made out of two parts, one central disk that rotates and has a red triangle that is the alarm pointer and the outer part that actually has two concentric shades due to the way it was finished. The hands and the applied hour markers are gold to complete this beautiful look. There is not much text on it except for “Citizen Alarm” and “19 jewels Phynox” and in the lower part “Japan”. The movement is the most important part of the watch and the reason why this watch is a real success, the first Citizen alarm movement. 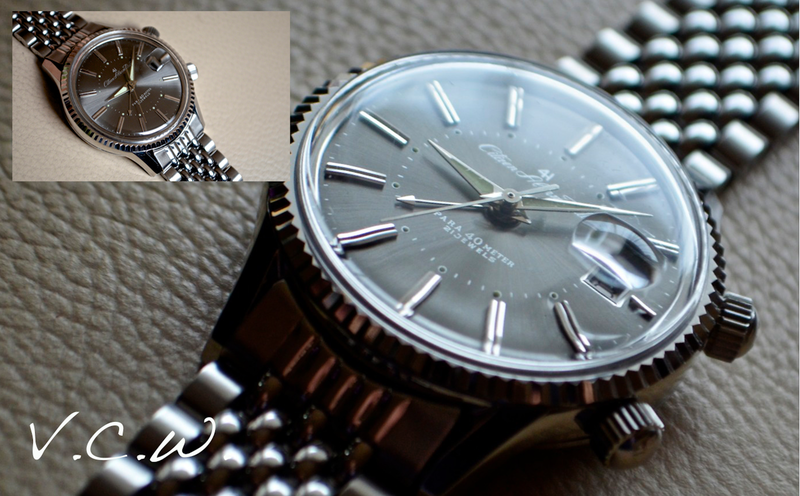 It is the manual wind Citizen calibre 980, 19 jewels, 3 adj, 18,000 bph. Very beautiful and working like a champ. The blue central disk watch above has a special case-back, made of two connecting layers, the top part having 6 holes and the entire piece acts like a resonance chamber so the sound of the alarm is really, really loud! update: another version I found online is this one, black dial with contrasting off-white central disk. Notice the red and blue writing on the dial! Beautiful! The case is gold plated. Bottom line, it is a gorgeous watch with a wonderful movement, a real time capsule and one of the most important watches Citizen made. Every collector should have one. 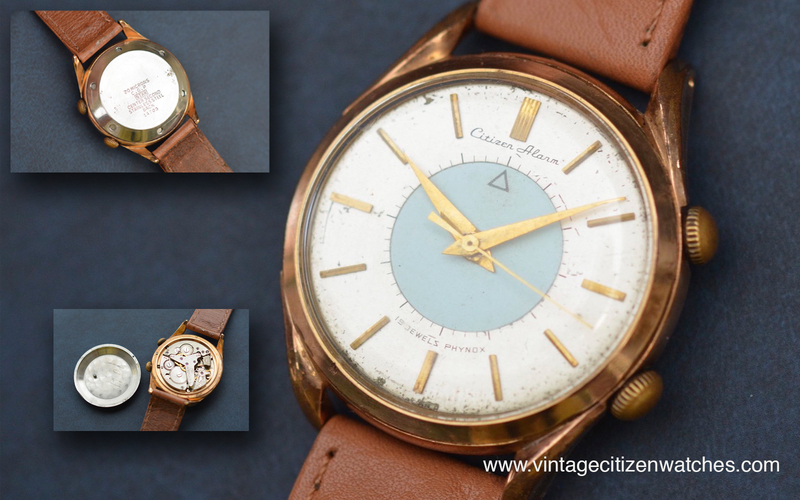 Read more about another simple, no date, vintage citizen alarm watch HERE. The rest of the alarms (date or no date, elegant or sportier) you can find HERE. Citizen has a beautiful range of vintage alarm watches, some of them with date, some of them more simple, like this one, without a date. Here is the no date version of the Citizen alarm, the Citizen College Alarm. It is marked Parawater and this fact, along with the serial no, is dating it to March 1968. The design is simple and clean, the case is made in stainless steel, with a domed acrylic crystal. 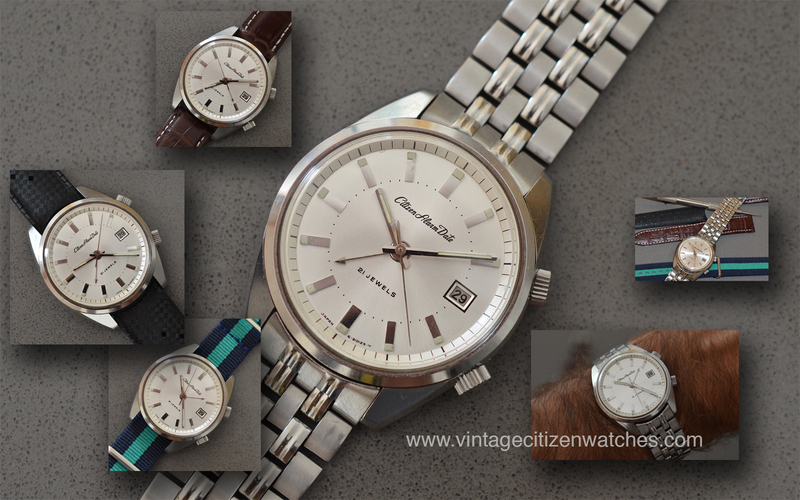 Read about how to date a vintage Citizen here. One of the best feature of the watch is the pie-pan dial look. On closer examination the dial turns out to be flat but the two types of finishing and tone gives it this lovely appearance. The central part has a silver sunburst effect while the outer ring has a circular one. On this circular part we can see the polished applied hour markers that have a black painted line or two (for 12, 3 6 and 9). It is marked in black writing: “Citizen College Alarm” at 12 and “parawater 17” at 6. The 4 polished hands are for showing the time and the shorter one, with a triangular tip is for the alarm. The hour hand (as well as the minute one) has a a central longitudinal black line, to match the hour markers. The case is made in stainless steel, with 38 mm diameter, the lugs are elegant and the two unsigned crowns are easy to operate and still very well suited to compliment the elegant design. The bracelet and the clasp is made in stainless steel too. 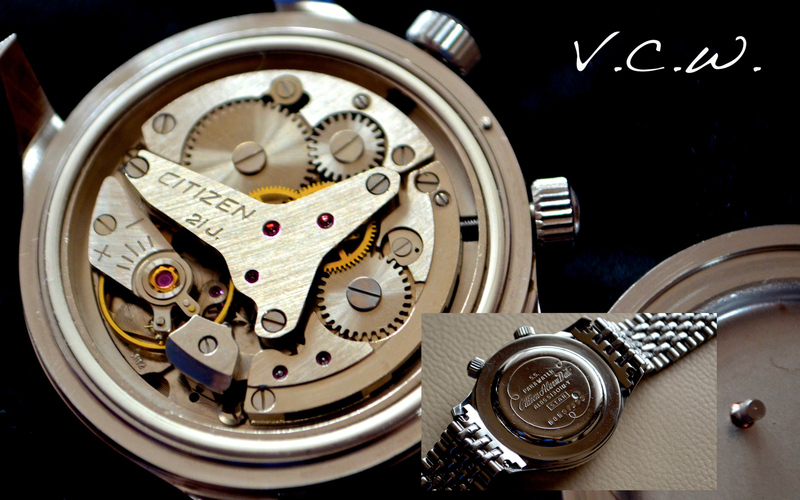 The movement is the Citizen calibre hand winding 9812 (no date), 17 Jewels, 18000 bph. The crowns are one for the time and the one for the alarm. The crown at 2 o’clock in first position is winding the alarm and the alarm is deactivated. If you pull it in the second position you can set the alarm (counterclockwise) and the alarm is activated. Pressing it while the alarm is ringing will stop it. The crown at 4 will wind the watch and pulling it out will set the time. The alarm will ring for 13-16 seconds. The movement has a power reserve of about 40-45 hours and it runs great if winding it once a day. It is Parashock. 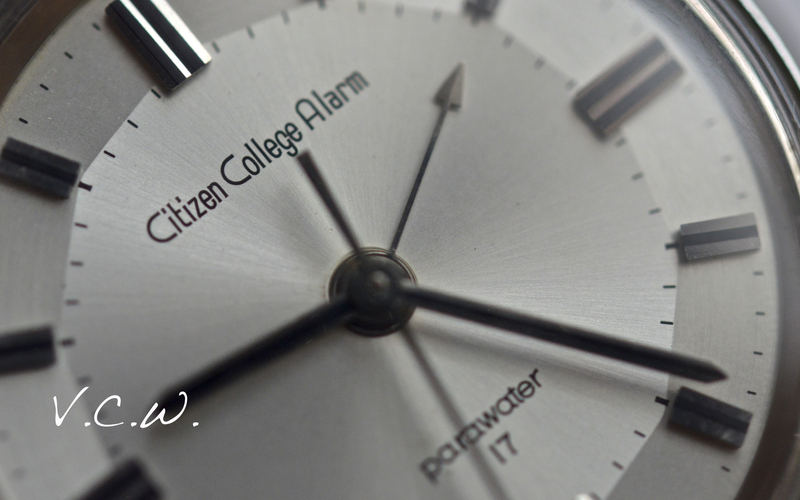 Read more about another beautiful Citizen alarm, the Citizen Alarm Date here. 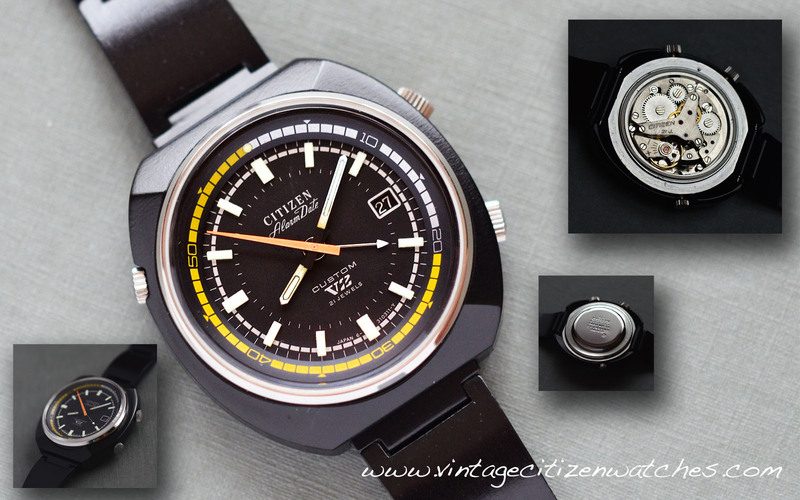 Beautiful watch, elegant design, and excellent, close to mint, condition. The sound of this watch is loud and powerful. The bracelet is comfortable and… let’s take it one step at a time. What’s that The “Grail” watch? Well… it is the watch that rumor has it that exists but can not be found. You look for it years after years and from time to time you think you find it, but than you realize it was not THE one, but only some pale imitation. You look for it again and again and again. Sometimes you dream about it, sometimes you think you see it strapped to someones wrist but time after time you find out it was just a mind trick. Your eyes see only what your mind fantasizes about. One glorious night, after hours on web searches, you find a post with pictures attached to a post in a language you don’t understand. That is the real watch! It exists! Maybe… Maybe… Should you allow your heart to hope for an answer? (feb 2014) Let us pray for THE Holly Grail! UPDATE (oct 2014) I found not one but two owners of this model. One owner doesn’t sell it (yet) and I am still waiting for an answer from the second one. I hope he still has it and will sell it to me. 🙂 Well.. he is not selling it. 😦 The search is still on. UPDATE (feb 2015) The hunt is over! I have it in my hands! Tired and extremely happy! Read abut THE Citizen HERE! Facebook is a great place to meat great people with really great watches. 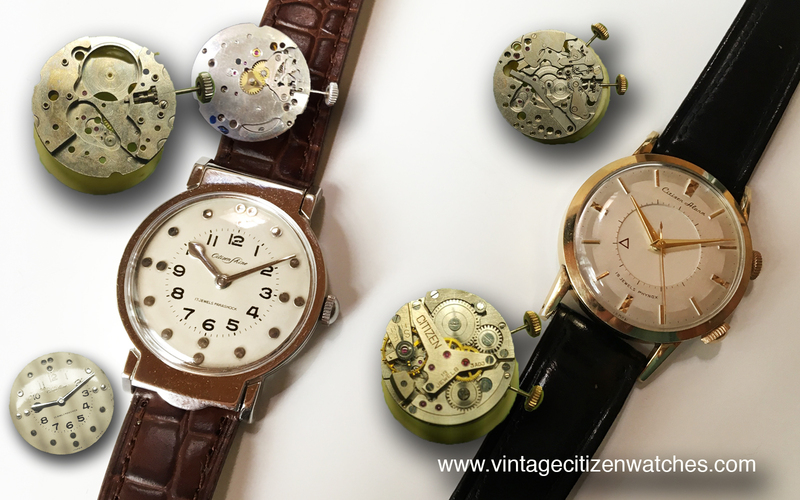 🙂 This is why we have created the Vintage Citizen Watches official group page. Check it out and add yourself and your friends! 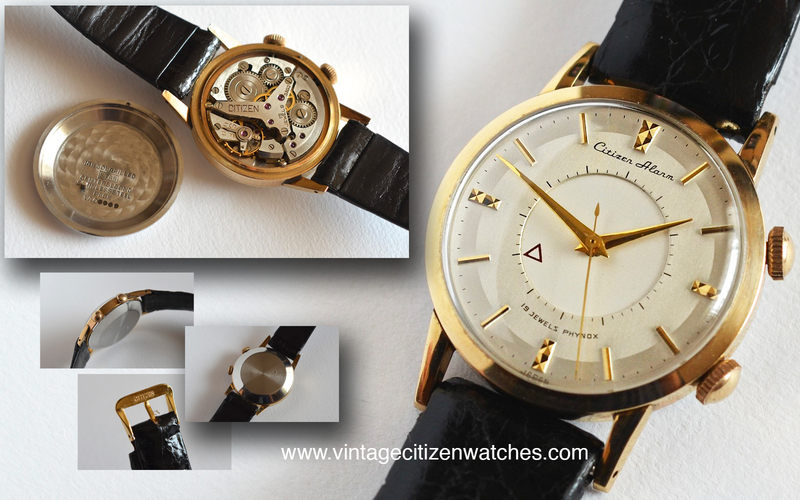 Here it is: https://www.facebook.com/groups/vintagecitizenwatches/354822734656228/?comment_id=354922047979630&notif_t=like Thank you for looking! Starting 2014 with a 1968 Citizen Alarm Date – model ALDS51301a-y. This is, again, an alarm Citizen, but in in an entirely different presentation. The case has a classic shape, round, with nicely shaped lugs, not too thin, not too thick, following the shape of the wrist. 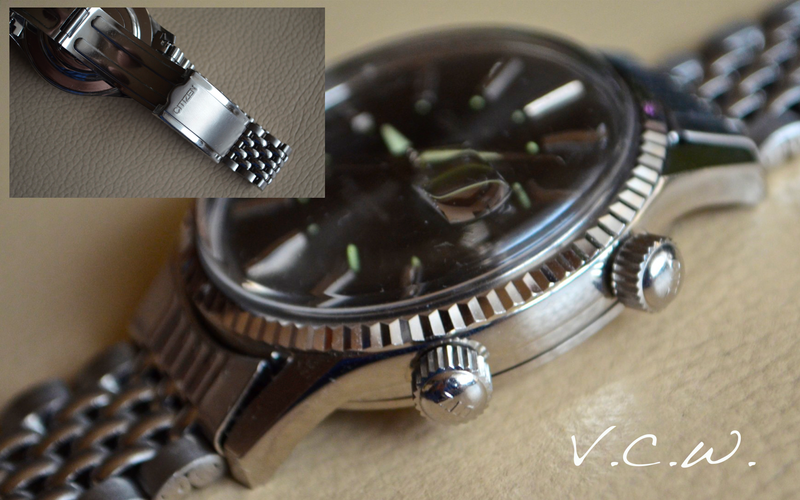 The caseback has a flat surface but it is raised to integrate the movement. Due to the curvature of the lugs the watch sits comfortable on the wrist. The caseback snaps into a certain position because it needs to be in a unique place so the alarm will interact as it should, with the pin attached to the inside of it. The place where the pin is, is also visible on the outside. There are no crown guards to interfere with the overall case design. The twin crowns are of a consistent size, easy to operate, signed “CTZ”. One of the main visual attractions is the fluted bezel that compliments the design of the watch. The crystal is made of domed acrylic with a magnifier at 3’o clock for a better view of the date. The dial is a stunning sunburst pattern grey that, depending on the lighting conditions, displays many shades ranging from dark grey (almost flat black) to light, shinny, bright grey. The hands are polished, the hour and minute hands are with green luminous material. The alarm hand is shorter with a triangle tip. The dots for the alarm hours are painted on the dial with luminous material as well. There are small lines every 15 minutes but only the hourly ones are luminous. The baton markers for the main hours are raised, applied and polished. They are faceted for a better legibility. The writting on the dial is thin, white, painted. 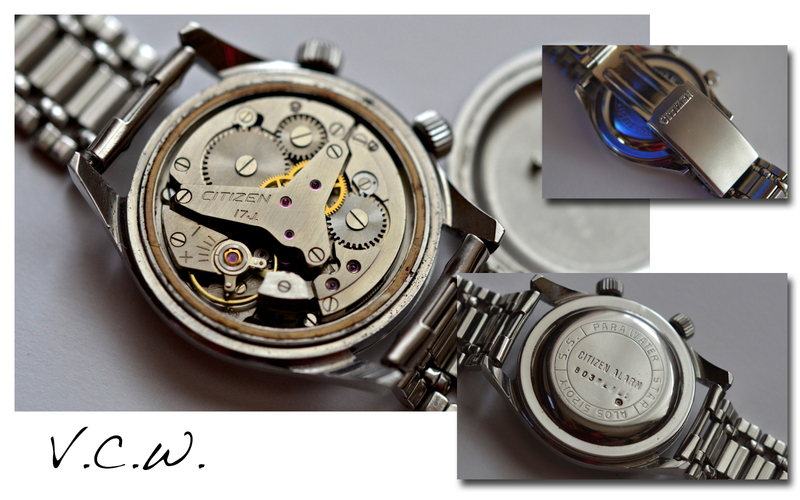 It reads: “4H” (this is for 4 hands) “Citizen Alarm Date” and on the lower part ” Para 40 meter” and “21 jewels”. The date wheel is white with black digits. 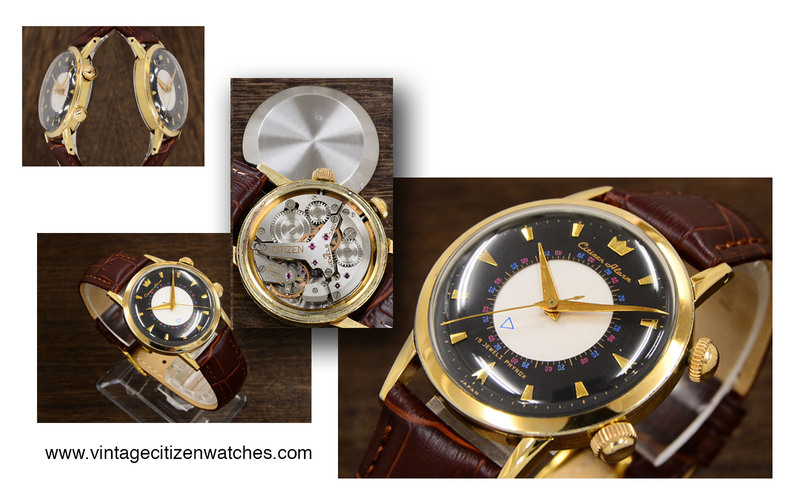 The movement is the USSR calibre AS 1475 based Citizen alarm. This is the calibre hand winding 3102 (date), 21 Jewels, 18000 bph. The crowns are one for the time and the one for the alarm. The crown at 2 o’clock in first position is winding the alarm and the alarm is deactivated. If you pull it in the second position you can set the alarm (counterclockwise) and the alarm is activated. Pressing it while the alarm is ringing will stop it. The crown at 4 will wind the watch and pulling it out will set the time. The alarm will ring for 13-16 seconds. The date is set by changing 22-24h. The movement has a power reserve of about 50 hours and it runs great if winding it once a day. It is Parashock. The bracelet is (as the entire watch) made of stainless steel. It has the most comfortable design ever – beads of rice. The central part is polished and the side links are brushed. As for the clasp – it is the other way around, the central part is satined and the lateral in polished. The clasp is signed – “Citizen”. Conclusion: Beautiful watch, comfortable, elegant design. It has a loud sound and a pleasant design. Such a beautiful vintage time piece!